We never had crêpes growing up. My Dad was the king of pancakes and breakfast-for-dinner nights when my mom was off duty. If we were lucky our sunday morning flapjacks would come bearing mini chocolate chips. Some in the shape of a ‘J’ for me and a ‘S’ for my sister and some others in very curious looking forms that we would try to poor for ourselves. Sitting around the kitchen table, filling our bellies with pancakes in our pj’s – some memories just stay with us as we grow up. During the winters in France, every night I would pass a little crêpe hut on my walk home after work. The smell was enough to stop you in your tracks. And if I was feeling like a loving wife, I’d brave the tourist line up and pick up one of Matt’s absolute favorite treats – a warm crêpe filled with chestnut cream. When I came through the door with his treat wrapped up in a fancy paper plate, I bet the massive grin on his face was exactly the same from when he was a little kid, because those were the flavors that he grew up with. On the night before we left sweden (for the first time), we made a big feast for everyone. Matt must have made over 60 crêpes and I took take of all the fillings. 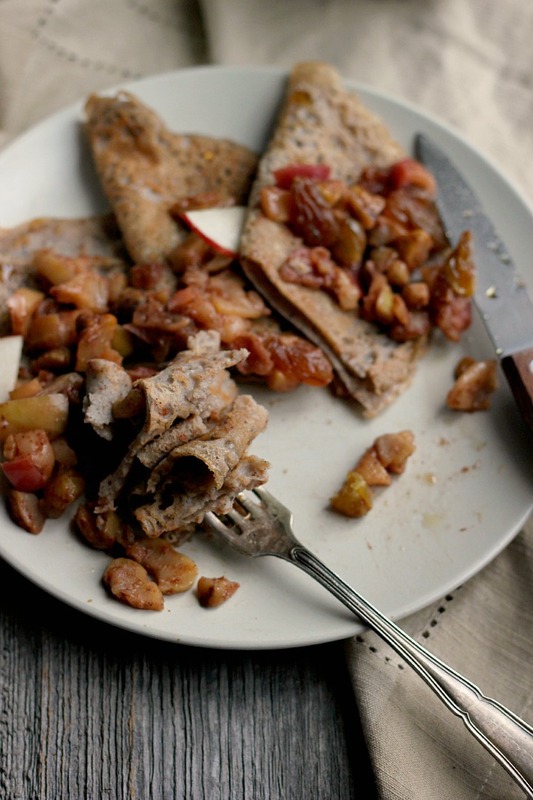 We served it up traditional French, with savory crêpes for dinner and sweet ones for dessert. We were a good mix of Swedish, French, German and Canadian around the table and it was a meal that was maybe new to some, but familiar to all. I just love how food can bring us together that way. 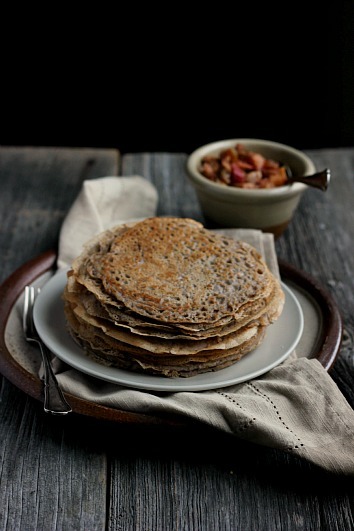 These crêpes, well they aren’t your typical kind, but they are the perfect marriage between a pancake and a crêpe – whole and hearty like a pancake, but still soft and thin for all of your favorite fillings. I used whole, gluten-free flours and natural sugars for me, with a few roasted chestnuts in the mix for Matt and maple syrup just keeps everyone happy. Hoping one day they’ll make happy memories for our family too. Feel free to use another nut here instead of chestnuts – hazelnuts or walnuts would be a nice alternative. Roasting the chestnuts is necessary in order to peel them, but I have seen roasted, peeled chestnuts available is most grocery stores if you need to save on time. Most crêpe batter recipes say to let the batter sit for at least 30 minutes to and hour, but I don’t always have time for that. A tablespoon of arrowroot powder will help move things along as it thickens the batter and helps the crêpes hold together in the pan without any wait time. If you have the time to let the batter sit for an hour, I imagine you can leave this out completely. 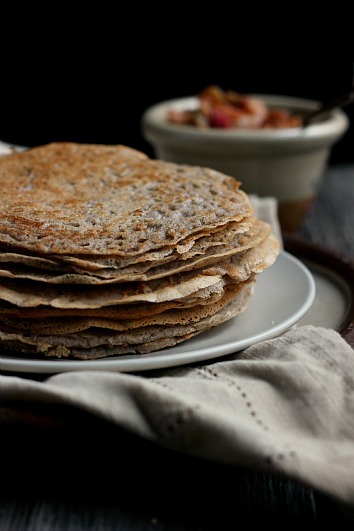 Crêpes are best served right out of the pan, but they can be reheated the next day if you have leftovers. 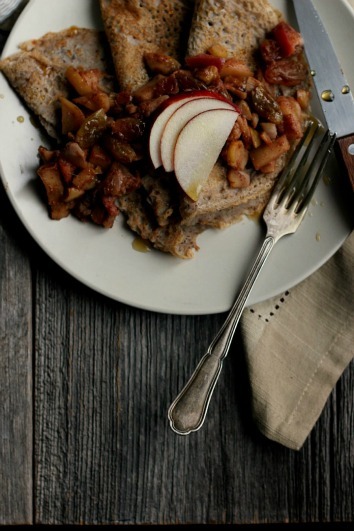 Next time I’m hoping to try out some savory fall fillings – any fun ideas? I’d love to hear them! 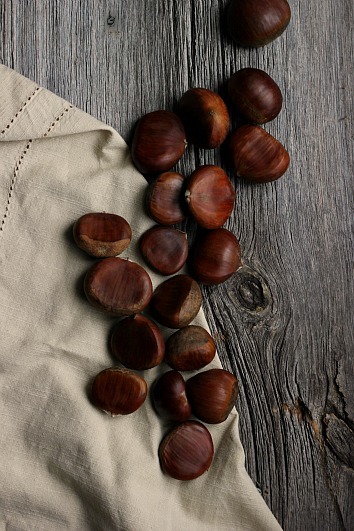 When buying chestnuts, look for healthy unwrinkled shells and a glossy brown finish. Fresh chestnuts are firm to the touch and heavy in the hand, with no space between the shell and the meat of the nut inside. Vegan + Gluten Free. Makes about 20 small crêpes. 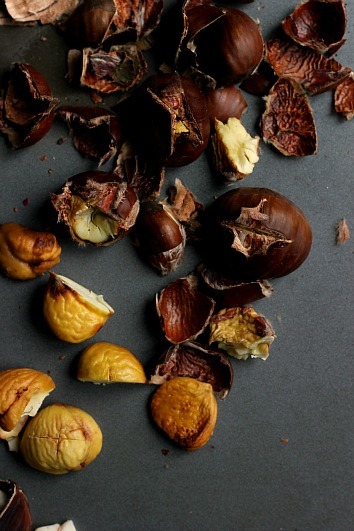 First, using a sharp or serrated knife, make an incision through each chestnut shell, just into the flesh of the nut, and work your way around half its circumference. Make an incision the same length but in the opposite direction to make an X. Repeat for all nuts. Place on a rimmed baking sheet and roast in the oven oven for about 30 minutes or until the outer shell starts to peel away from the center of the X. Remove from oven and let cool slightly. While the chestnuts are still warm, remove and discard each shell and the papery skin with a small knife or just your fingers. Roughly chop the nuts and set aside. Cut the apples into small cubes, I chose to keep the skins on here but it you want more of a sauce than a relish peel the apples first. 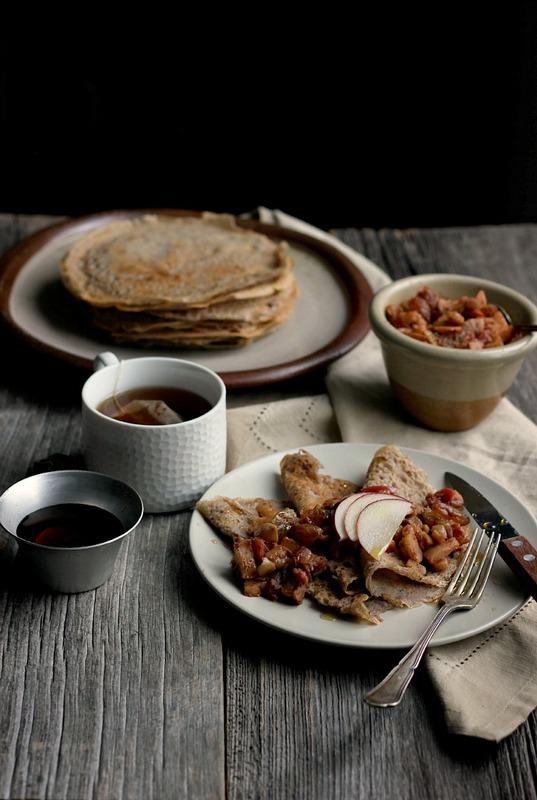 Place apples in a small saucepan with 1/4 cup of water and add the spices. Bring to a simmer and cook down until the apples are soft and tender and starting to fall apart, add more water if need. 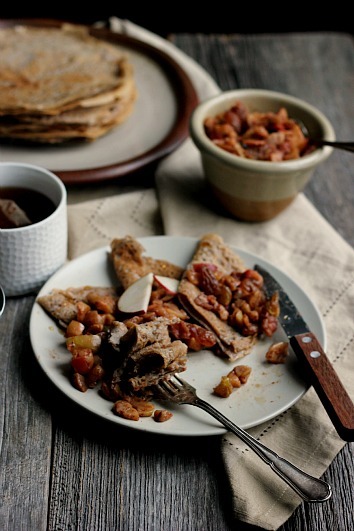 Stir in chestnuts and golden raisins to warm through, then remove from heat and stir in apple cider vinegar. Set aside. 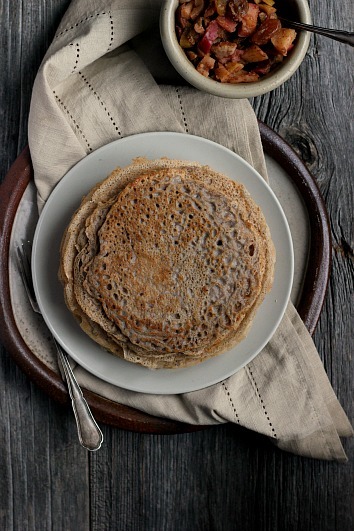 Place all crêpe ingredients in a blender and blend until smooth. 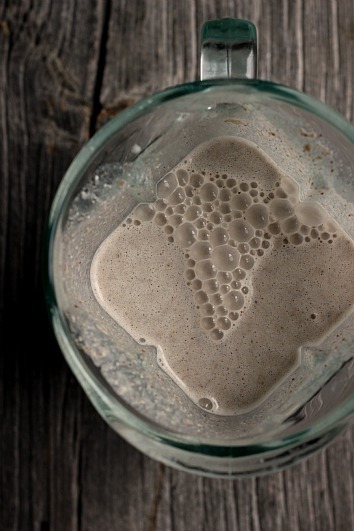 Tip: put wet ingredients in the blender first and then add flours so that the dry ingredients don’t get stuck on the bottom. Heat a non stick pan over medium heat and brush with a little coconut oil. Poor in about 1/4 cup of crêpe batter and swirl to evenly distribute. Cook for 45 seconds to a minute or until the batter bubbles and is just set in the middle, then run a spatula around the edges and flip, cooking on the other side for 30 seconds to a minute or until golden brown. Serve immediately or place on a baking sheet in a warm oven until ready to serve. Repeat with remaining batter. 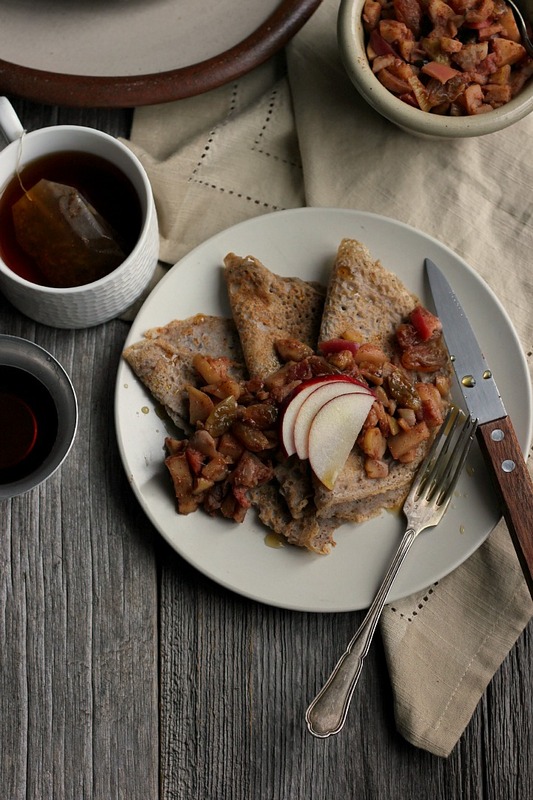 Serve crêpes with warm apple relish, a few fresh apple slices and a good drizzle of maple syrup. 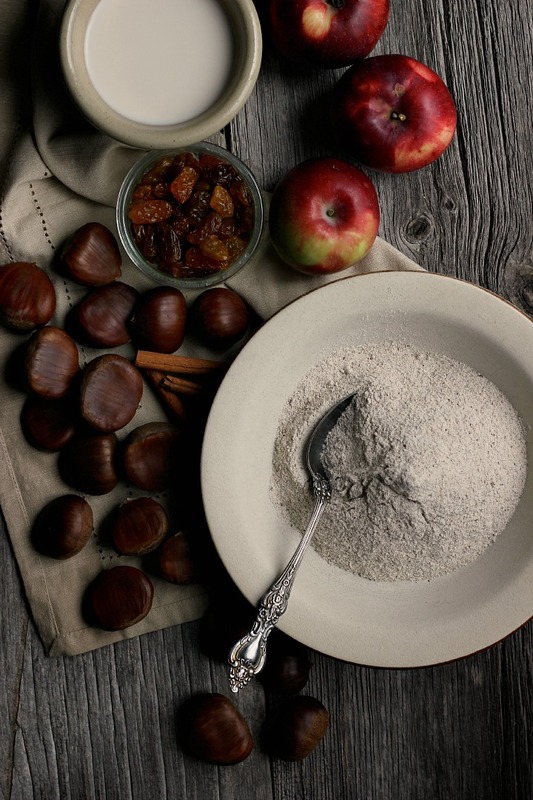 These looks just delicious and what a lovely story to go along :) .Also, in Portugal, we celebrate S. Martinho (Saint Martin’s day) today and traditionally eat chestnuts so your recipe came right on time :) thank you! HA! We used to get the occasional chocolate chip pancake, too. And every once in a blue moon it’d be in the shape of Mickey mouse – never our initials – because my dad’s pancake shaping skills were limited to circles, sadly. This sounds so, so good! We had pancakes growing up too, but adulthood has introduced me crepes, thankfully! That crepe place in Sweden sounds dangerous. I wouldn’t have been able to stay away. I love the use of chestnuts here. Thanks for sharing and inspiring me to get back into making crepes. These are beautiful pictures of beautiful food! I’ve never made gluten free crepes but they seem to have turned out very well. These sound and look really yummy. I have never made crepes so here goes! Can I use corn flour/ starch instead or am I going to have to drive to the store to get some arrowroot?